That's the end of another enjoyable day at the 02. Hopefully the standard will be just as high on Wednesday when British number one Andy Murray takes on Rafael Nadal at around 14:00 GMT. It feels like an age since we last saw the two of them going at it. Can Nadal beat a big gun? The winner will reach the semi-final. "I hit it well out wide today. I knew it was an important serve to get Novak off the court," Federer tells Sky Sports. Federer's victory means he has qualified for the semi-finals. Djokovic must beat Tomas Berdych, who himself still has a chance of qualifying, to guarantee his spot in the last four. Djokovic had won 15 straight matches at the ATP World Tour Finals - but Federer has brought an end to that winning streak, too. Currently at the 02, Stefan Edberg is being inducted into the Tennis Hall of Fame and has received a knuckle-breaking ring. 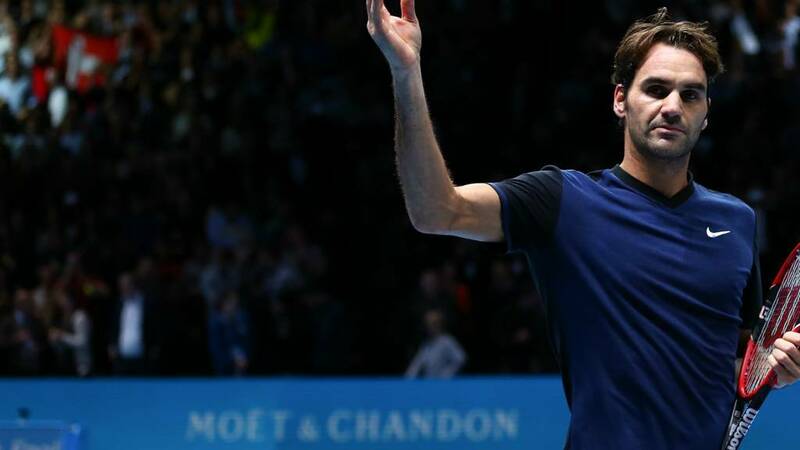 Federer's victory brings an end to Djokovic's 38-match winning run indoors. It also ends the world number one's 23-match win run since he lost to Federer in Cincinnati final on 23 August. Matt McGladrigan:#Djokovic probably doubled his 2015 error count in that last 20 minutes. #FinalShowdown. Joel Newnham: Who thinks these two will meet in the final? Asked what tactics worked well, Federer tells Sky Sports: "I won't tell you because we might play again." After the laughter dies down, the Swiss expands: "The tactic was to mix it up. I have to against Djokovic." How long can Djokovic hang on? That question is soon answered. The Serb goes long with a forehand. Second match point Federer. Djokovic steps in on the next point... He eyes the winner, but that forehand looked wide. It's called out. Djokovic challenges. Tension, drama before the curtain is drawn. And replays proves the ball bounced wide. A first defeat indoors for the world number one since 2012. Magical. A beaut of a backhand return from Federer brings up his first match point. Sometimes there are no words, sometimes you just have to watch and admire. The longest rally of the match begins... silence as the pair battle it out for 23 shots, 24 shots, 25 shots... Federer into the net. His wife, Mirka, winces. Djokovic lives on. But Federer reels him in from advantage with a thumping forehand into the corner. Deuce. Quote Message: Novak Djokovic's mental state is maybe not as tough as we are used to seeing. There have been six or seven shots in the last couple of games where he's fallen below his usual standards. Novak Djokovic's mental state is maybe not as tough as we are used to seeing. There have been six or seven shots in the last couple of games where he's fallen below his usual standards. Can Djokovic come back from here? You wouldn't bet against it. The Serb usually has infinite reserves of energy, but he's just been a touch off colour this evening, winning just 29% of points on his first serve in the second set. The backhand is his enemy, too, another botched shot allows Federer to level at 30-30. The crowd willing the Swiss on. Djokovic rattled. Spectators sigh in unison as they watch a Federer backhand loop towards the ceiling. But a tired-looking forehand into the tape from Djokovic takes us to deuce. Djokovic is making too many errors. The Serb looks skywards, but he needs to look at his groundstrokes for that is where the problem lies. The Serb's feet aren't moving in unison, a wild swing at a forehand, and Federer holds to love. He's within touching distance. Djokovic's 23-match winning run could soon come to an end. Opening blow to Federer. Djokovic rolls his eyes, takes an deep intake of breath. The Serb is not amused. Djokovic coming into the net... A serve and volley...Federer, feeling the pressure, nets. Djokovic embarks on an angry monologue despite winning the point to level at 15-15. The red mist playing havoc with Djokvic's mind. He's lost his cool, and two points. Quickly. Two breakers. And Federer takes them with ease. A peachy backhand down the line. The Swiss with acres of the court to aim at. There's no weakness in Federer's serve. His forehand could do with a talking to, though, as an iffy balloons wide for 40-30, giving Djokovic a sniff. But Federer simply marches on without fuss. Sophie Bonner: Tense but backing @rogerfederer for the win! #bbctennis amazing tennis tonight!! For a moment, for a millisecond, Djokovic showed a hint of vulnerability at the start of this set, but other than a dreamy Federer winning return, the Serb has little trouble holding. His first serve percentage has dropped, but the second serve is solid enough. The pair exchange blows from the back of the court on the final point... Federer looks to be gaining an advantage, but Djokovic nonchalantly places a backhand winner beyond the Swiss' reach to hold. Quote Message: The style of tennis Federer plays means they bring out the best in each other. Djokovic's ability often goes understated - look at how he pegged Federer back there. That's why Federer respects him so much. The style of tennis Federer plays means they bring out the best in each other. Djokovic's ability often goes understated - look at how he pegged Federer back there. That's why Federer respects him so much. What a match. Djokovic isn't a man who will give up lightly. The Serb collects two break back points. Federer erases one with a classy serve. But the Serb's defence is impenetrable on the next point, Federer rushes a forehand, wide it goes. Talk of Djokovic's demise has been greatly exaggerated. He's been up on his feet in ecstasy, he's had his head in hands in misery - and that was just the first game. Federer's overwhelming popularity comes as no surprise but one gentleman a few rows in front of me has been living every point of this. Meanwhile, Swiss chants boom out from the clumps of red visible in the darkness. The O2 is hosting the Federer show once again. Federer, who takes a 0-15 lead, has won 15 of the last 20 points. Make that 16 as Djokovic's forehand malfunctions once more. The Serb has stumbled upon difficult times. Federer supreme, bullying the world number one. Djokovic into the tape and the six-time champ has three break points. A serve out wide, a forehand into the same corner. One break point saved. A canny second serve, catching Federer unawares and the Swiss nets the return. Two break points saved. A sliced return from Federer... Djokovic unsteady on his feet... scooping... wobbling... and his backhand volley goes into the tape. We go again. Hopefully these two will be going all night long. Federer wrong footing Djokovic with a canny forehand. It's not often the Serb is tricked in such a way. A1 defending from Federer for a routine hold. Quote Message: These guys are serving up an early Christmas present here. It's a cracking contest. These guys are serving up an early Christmas present here. It's a cracking contest. Quote Message: Perfect tennis from both players and Federer with the deftest of touches drops it over the net to win the point. It needed that magic to break the deadlock. Boy, what a match this is. The standard of tennis is of the utmost quality. Perfect tennis from both players and Federer with the deftest of touches drops it over the net to win the point. It needed that magic to break the deadlock. Boy, what a match this is. The standard of tennis is of the utmost quality. Another ace from Djokovic. That's one way of stopping the rot. Federer, though, a geometric delight, finding zany angles all over the court, posing questions, and not even a man of Djokovic's steel can hold firm in such circumstances. Deuce. Second Set point. Ear-drum rattling roars. Bravo! Federer on the front foot, working Djokovic this way and that, before producing a breathtaking volley which dramatically kisses the line. The Swiss forms a fist. The crowd yell their approval. Beautiful. A mammoth baseline battle... the pair trade blows... 22 shots, 23 shots, and it's Djokovic who stumbles, chucking a forehand beyond the baseline. 15-15. A beefy serve nudges the Serb ahead. Plenty of variety in the Serb's arrows, slicing, dicing... But Federer, undeterred, is bold and brave, coming into the net and, once again, Djokovic falters. Long once more. 30-30. A chance. Paul Staveley: Both these legends bringing their A game -should be a real ding dong here! They have a class that separates them from all others. Quote Message: They have whizzed through these games with some clean serving, apart from the one break point chance Federer fended off in his opening service game. They have whizzed through these games with some clean serving, apart from the one break point chance Federer fended off in his opening service game. Classy from Federer. The Swiss produces his most confident service game in squeaky-bum time. A hold to love and it seems as if this set will be decided in a tie-break. The O2 spectators turn up the volume as Djokovic bounces a few balls onto his racquet. He's waiting for the din to quieten before he serves. Federer showing ambition, attempting a curling forehand winner which drops long. 30-15. A first double fault for Djokovic. Former England wicketkeeper Alec Stewart, sitting near Boris Becker, quietly looks on while a few spectators gasp at the Serb's error. 40-30. A gettable serve for Federer... his eyes widen... adrenaline pumping... but he's wild and loose with the return. Opportunity missed. A swing of the hips from Federer on the opening point, the Swiss hitting loose and free with a thunderclap of a forehand. He then closes with a stonking backhand winner down the line. Two thigh-slappingly good shots bookends to fabulous serving. There's yet to be a truly magical baseline slug-fest or jaw-dropping exchanges of volleys because both men have been serving with such aplomb. Djokovic lasers an ace towards his rival for a 40-0 advantage, an unreturnable second-serve down the 'T' seals the deal. It's all quite beguiling in an unspectacular sort of a way. Quote Message: Federer has had some good serves which have dug him out of trouble while Djokovic is getting a slight upper hand at the baseline. We've seen these two play 42 times so there won't be any surprises how they play - it's all about who can take their break points. Federer has had some good serves which have dug him out of trouble while Djokovic is getting a slight upper hand at the baseline. We've seen these two play 42 times so there won't be any surprises how they play - it's all about who can take their break points. Who knows which way this match will swing. The pendulum currently tree trunk still, unwilling to swish in favour of either side. Federer upping the ante, threading a fabulous down-the-line winner to gallop to 40-15. Djokovic unable to cast his spell from the baseline because the Swiss is serving with such unnerving accuracy. Djokovic testing the Federer backhand, bash, bash, bash, crosscourt to crosscourt... but the Swiss is holding firm and it's the Serb who falters, sending a forehand long. Federer the more prepared of the two to gamble, to throw the dice, which he does when with a feather-soft dropper which curls onto the paint. Djokovic sprints in an attempt to retrieve but volleys into the tramlines. 15-30. Volume lifts inside the O2. Djokovic, though, as calm as a cucumber wrapped in an ice pack. He hits cleanly from the baseline, the forehand is his friend now, and comes through with distinction. Federer oozing confidence as he arrows a boomer of an ace down the middle for a 40-0 lead. Just as in Federer's previous service game, though, Djokovic claws his way back into contention - a dazzling winning return for 40-30. But Federer simply unleashes another ace to nip the comeback in the bud. The 02 crowd have been more vocal, they're currently too transfixed on the game's greats to burst into any sort of song. Djokovic content to remain on the baseline, occasionally stepping a foot or two in to crunch home a forehand winner. He proceeds to 30-0 with ease. Federer unable to truly test the world number one, a forehand long, Djokovic to 40-0. A screwed backhand into the tramlines the only error from the Serb before he serves out wide to comfortably hold. Djokovic may be unbeaten indoors since 2012, he may be on a seemingly never-ending winning run - but how many titles has he won indoors, eh? Not as many as Roger Federer, who has 22 well-polished prizes in the bag. In fact, no-one has a better win-loss percentage record indoors than the Swiss who has won 261 of his 324 matches under the protection of a roof. Federer serving with a surgeon's precision, hitting his targets, racing to 40-0. There's a blip - which Djokovic eyeballs and returns with gusto, then a double fault. 40-30. But the third seed pulls through. No fireworks yet. Andy Jamieson: Djokovic (sadly). Fed is sensational but not quite as much as Djokovic. Boris Becker crouched forward in his seat. Djokovic's coach is wearing a fetching scarlet tracksuit top this evening. Two easy opening points from Djokovic. There's a hint that Federer will make a contest of it when he nicks a point for 30-15, but the Swiss scoops a backhand into the crowd, giving Djokovic a much-needed breather. But - whoa! Incredible from Federer. An unstoppable return down the line. But the Serb serves out for a routine hold. Max Baggins-Craig: This will be without doubt a brilliant match, fantastic few days we're having, tennis never lets you down. Quote Message: Djokovic's movement, especially his ability to keep control while at maximum stretch, even astounds the best in the game. Djokovic's movement, especially his ability to keep control while at maximum stretch, even astounds the best in the game. A rousing chorus of approval greets Federer as he launches an ace to the wings to secure the hold. Djokovic didn't have a sniff from deuce onwards. Federer is the man testing the bounce of the yellow balls, which suggests he will be the man getting this match under way. The Swiss aggressive from the get-go, prowling to the tape on the second point - only he miscues his volley to allow Djokovic to level at 15-15. Federer to the net again on the next point, manipulating his opponent before seeing him off with a smasher of a smash. 30-15. Djokovic, though, hanging in, impressive retrieving drags him to 30-30 and a botched Federer forehand earns him a break point. The world number three, though, serves and volleys his way out of danger. To deuce? Let's. Fancy a chat? Fancy 'getting involved'? Excellent. This evening's question is simple enough - who do you think will win this skirmish and why? Tweet your thoughts using the hashtag #bbctennis. I'll be nice to hear from you. I know these stats that are being chucked at you might seem Novak Djokovic-centric, but that's because they are, because they're out of this world. The world number one has won 10 titles this year - including three of the four Grand Slams - and has reached a record 14 consecutive finals in a season. Has Djokovic got the edge? As we've mentioned, being the best in the business means Novak Djokovic and Roger Federer often go eyeball to eyeball on the tennis court. When it matters most, when the stakes are high, the pressure intense, Djokovic often pulls through, beating the Swiss en route to six of his 10 Grand Slam titles. Quote Message: We are fortunate to have two of the greatest athletes in sport. It's incredible that they are tied at 21 wins apiece. They are competing for major trophies and weeks at number one but they will end their careers knowing that one of them just had the upper hand on the other. That will count for something to them. We are fortunate to have two of the greatest athletes in sport. It's incredible that they are tied at 21 wins apiece. They are competing for major trophies and weeks at number one but they will end their careers knowing that one of them just had the upper hand on the other. That will count for something to them. If Novak Djokovic has discovered the answer to life, the universe and how to relentlessly hit the baseline, he's not letting on. "I have to disappoint you - I don't have one word or secret that describes the success that I had this year," he said on Sunday. "Many different factors have happened in order for me to be where I am at this stage. I'm 28 years old. There is a reason why I've managed to reach the peak of my physical, mental abilities at this stage of my life." Roger Federer and Novak Djokovic have emerged from the darkness, through the dry ice, and are about to toss a coin at the net and then warm up. The Serb blew some of his oxygen into his cupped hands before he was announced to the crowd. Cold inside the 02 perhaps? It'll soon be hotting up. If these mere words aren't enough (I am slightly offended), there's coverage on BBC Radio 5 live sports extra which you can listen to via the top of this page. There's more. The Serb has not lost indoors since 2012, which equates to a 38-match winning streak under canvas. His last defeat? By Sam Querrey in the second round of the Paris Masters. Federer and Djokovic were not exactly best buddies in the formative years of their rivalry, but there is nothing better for a relationship than quality time spent together (I'm told). They head into their 43rd meeting with the score tied at 21-21, and Djokovic has the chance to move ahead in their personal duel for the first time since their initial meeting in Monte Carlo nine years ago. If the Serb required extra motivation, that will certainly provide it. Tonight will be the 43rd time these tennis greats go head-on into battle and victory will ensure one of them gains supremacy in the series. Admittedly, that won't be at the forefront of their minds when they warm up in the O2. Incidentally, Djokovic has never been ahead in the series. The Serb tied it at 21-21 with his dramatic four-set win in the US Open final in September. Hello! Welcome to live coverage of the ATP World Tour Finals bout between the world's best player, Novak Djokovic, and the world's third best, Roger Federer. Djokovic is a man unbeaten since August, a man looking to become the first player to win this title four years on the trot. He's irrepressible indoors. Federer... well, no man has won this tournament on more occasions (6), no man has won more matches in this tournament (49) and no man has won more prize money ($13,433,000) than the Swiss. How do you beat a man who has forgotten how to lose? When the odds are stacked against you, do you still believe? When there's no sign of weakness, no chink in the armory, no hint of letting go, can you still envisage victory?